Good News for Work Outs: You don’t have to work as hard as you thought! Even though some health organizations recommend an hour of vigorous physical exercise every day, new studies show that these recommendations are grossly exaggerated and are not necessary if you want to reap the health benefits of being physically active. –It is not that working out a lot is bad for you but if you are intimidated by the numbers or you don’t have the time for an hour a day, don’t be discouraged. Taking just a few minutes a few times a week can still provide great results. –In fact, research has found that as little as 15 min. 5 times a week can greatly reduce the risks diabetes, lower blood pressure and cholesterol as well as lower risks of heart disease. –In addition the to physical health benefits, moderate exercise greatly helps reduce stress, increase energy levels as well as improves mood and an overall sense of wellness. –And .. it doesn’t even have to be strenuous. If you don’t like to run, walk. The key to better health is reaching a threshold of movement and not the duration of or intensity of exertion. — The take away from these new studies is don’t give up on exercise because you don’t think you have the time or it sounds too hard. 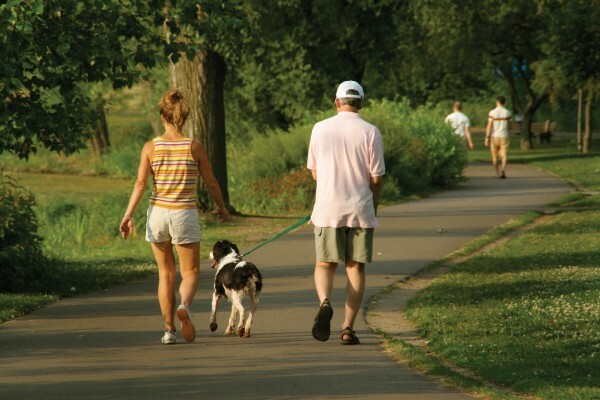 Something as simple as regularly taking a walk with your dog can be a path to better health.